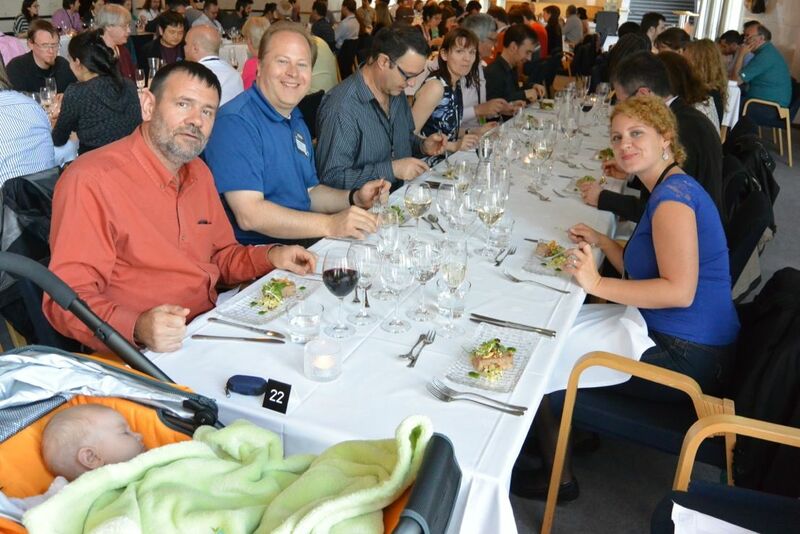 Helsinki was a great host city for the 12th Asteroids, Comets, and Meteors conference. 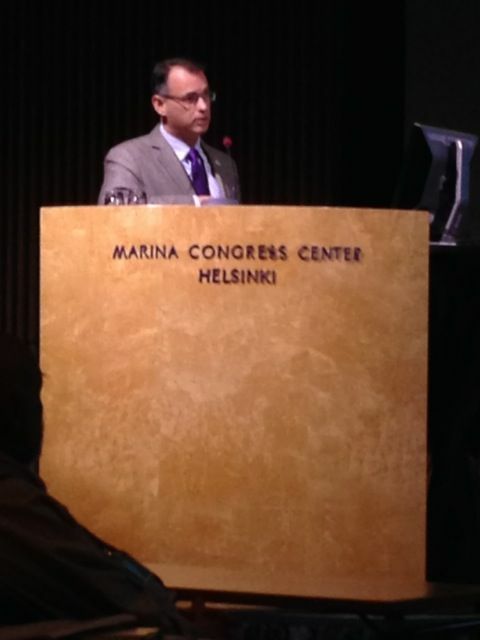 I just recently returned from a trip to Helsinki, Finland to attend the 12th Asteroids, Comets, and Meteors Conference. The ACM conference focuses on the research of small Solar System bodies and their role in understanding the formation and evolution of the Solar System. Topics range from the evolution of extrasolar planetary systems to the future resource potential of asteroid minerals. ACM constitutes the leading international series in the field of small Solar System bodies. The first three conferences took place in Uppsala, Sweden in 1983, 1985, and 1989. After the Uppsala conferences, the conference has taken place in Flagstaff, Arizona in 1991, Belgirate, Italy in 1993, Paris, France in 1996, Ithaca, New York in 1999, Berlin, Germany in 2002, Rio de Janeiro, Brazil in 2005, Baltimore, Maryland in 2008, and in Niigata, Japan in 2012. Over 500 scientists and engineers attended ACM in Finland this year. I arrived on June 27, giving myself a couple of days to be a tourist in Helsinki. I was joined by Harold Connolly, OSIRIS-REx Mission Sample Scientist. 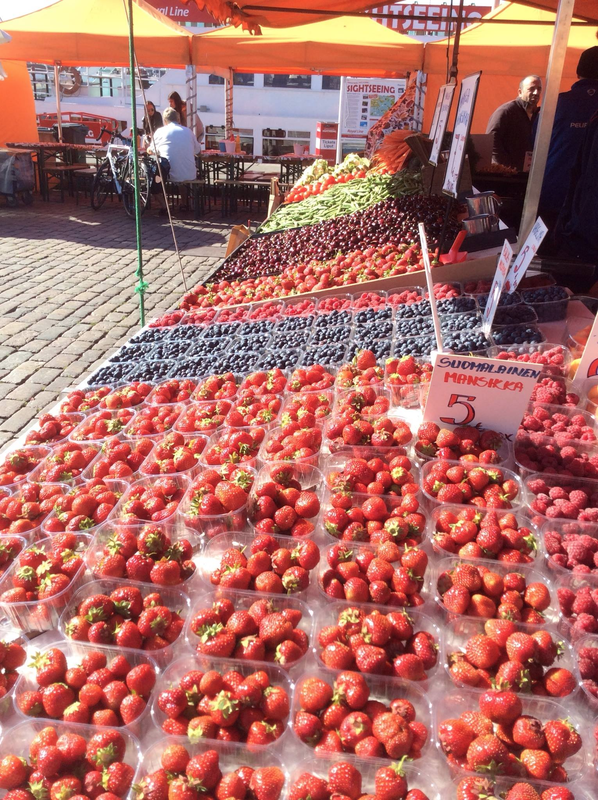 We toured around the center of Helsinki, visiting the famous Market Square, which hosted vendors selling everything from tourist souvenirs to delicious Finland berries. We also spent some time in the Kiasma Museum of Contemporary Art, the iconic Helsinki Cathedral, and the Helsinki Observatory., which hosted the opening reception on Sunday, June 29. 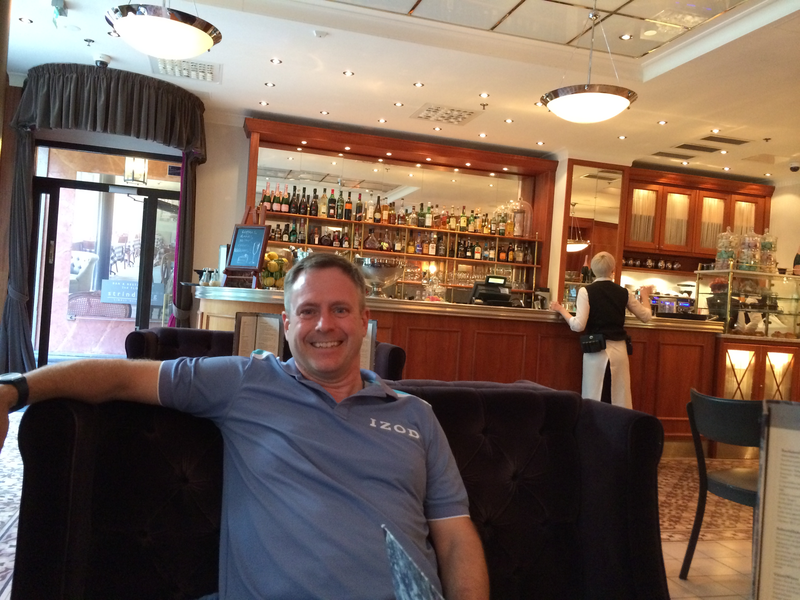 Harold Connolly and I got to spend a couple of days exploring Helsinki before the conference started. Finland is famous for their berries, which were delicious! 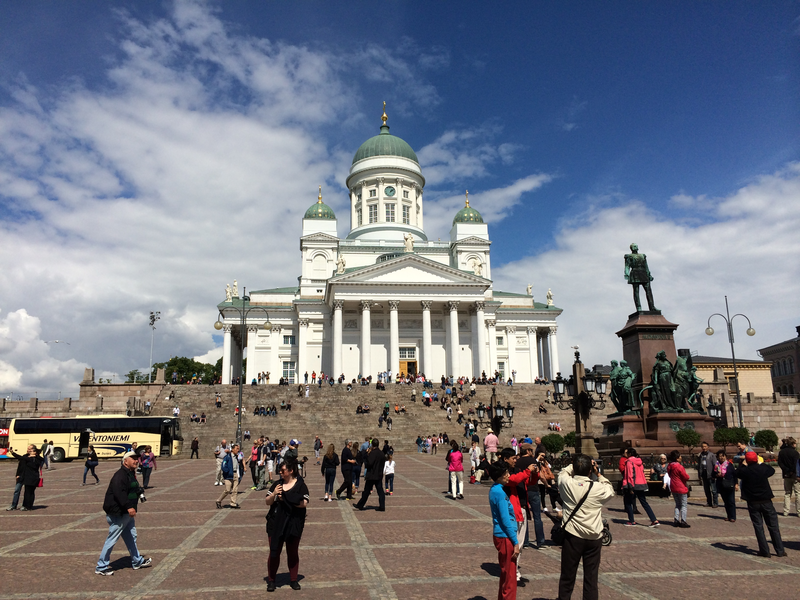 The Helsinki Cathedral is an iconic landmark of the city. Finland has the highest per capita consumption of coffee anywhere in the world. 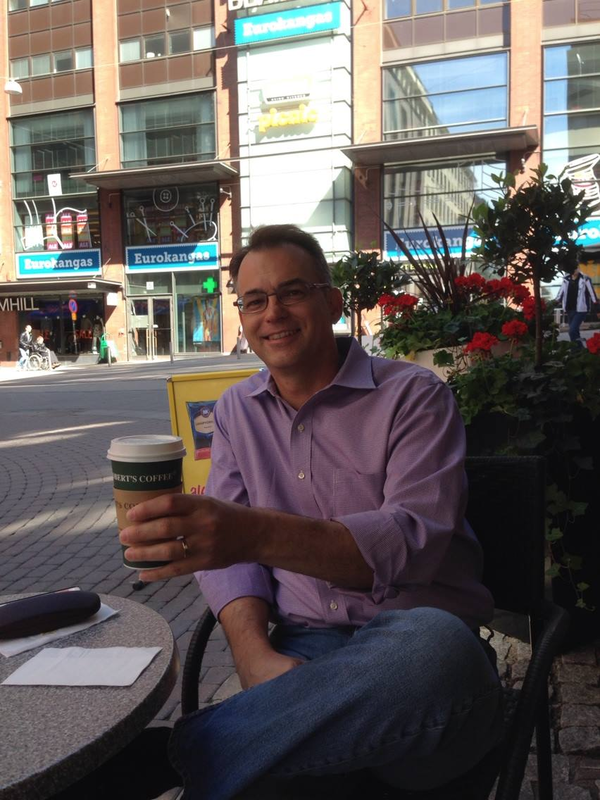 I took advantage of the great weather to enjoy a cup at a sidewalk cafe. OSIRIS-REx was very well represented at ACM. The first Osirian to present was Co-I Humberto Campins, who gave a talk on “Volatiles in asteroids”. For more than three decades, hydrated minerals have been identified in asteroids. The distribution of these minerals among asteroid spectral types and heliocentric distance has been somewhat unexpected, and there is also diversity in the composition of these hydrated minerals. In addition, water ice and organic molecules have been detected on two asteroids and water vapor is emanating from the dwarf planet (1) Ceres. Humberto described how these discoveries have important implications on current views of primitive asteroids, the nature of active asteroids or main-belt comets, the dynamics of the early Solar System, and the delivery of water and organic molecules to the Earth. They are also relevant to several space missions, including Dawn, Gaia, Hayabusa2, OSIRIS-REx, and WISE. OSIRIS-REx Collaborator Cateline Lantz presented the latest results from her research on ion irradiation of carbonaceous chondrites. She presented results from experimental irradiation of the Allende and Murchison meteorites exposed to Helium and Argon ions, as a simulation of solar-wind irradiation of primitive body surfaces. Interestingly, the observed weathering of asteroids suggests that this process occurs very rapidly, on timescales of 1,000 to 10,000 yrs at 3 AU. Co-I Bill Bottke presented an invited talk on “Exploring the collisional evolution of the asteroid belt”. He described how, by modeling the collisional and dynamical history of the main asteroid belt, and linking the results to constraints, we can probe how the planets and small bodies formed and evolved. The big question is how to use what we know to determine the main belt’s original size and state. This work is ongoing, but dynamical models hint at many possibilities, including both the late arrival and late removal of material from the main belt. Co-I Mike Nolan presented his latest research on “Radar scattering functions using Itokawa as ground truth”. Here he compared radar data to synthetic data using the Hayabusa-derived shape model of Itokawa to model Arecibo and Goldstone radar images and showed that the synthetic images match the observations well (see figure below). Radar data are used to reconstruct the shape of asteroid Itokawa. Co-I Steve Chesley discussed “Guided asteroid deflection by kinetic impact: Mapping keyholes to an asteroid’s surface”. The kinetic impactor deflection approach is likely to be the optimal deflection strategy in most real-world cases, given the likelihood of decades of warning time provided by asteroid search programs and the probable small size of the next confirmed asteroid impact that would require deflection. However, despite its straightforward implementation, the kinetic impactor approach can have its effectiveness limited by the astrodynamics that govern the impactor spacecraft trajectory. Steve showed how we are able to project Earth impact trajectories, or keyholes, onto the asteroid surface and how to target an impactor spacecraft for an area on the surface that avoids potential Earth impacts. Steve Chesley and Bill Bottke (left) enjoy the ACM banquet offerings. Co-I Marco Delbo described his latest research on “Effects of solar heating on asteroids”. He discussed how the radiative heating by the light from the Sun can inducer thermal fracture and/or desiccation cracking and the production of dust particles. In addition, the surface make up and mineralogy of these asteroids is altered by these strong temperature variations. In the same session, Co-I Josh Emery presented his work on thermal infrared observations and thermophysical characterization of Bennu, which I described in detail in a previous blog post. Collaborator Javier Licandro reported on “The GTC mid-infrared spectroscopic program of primitive outer-belt asteroids”. 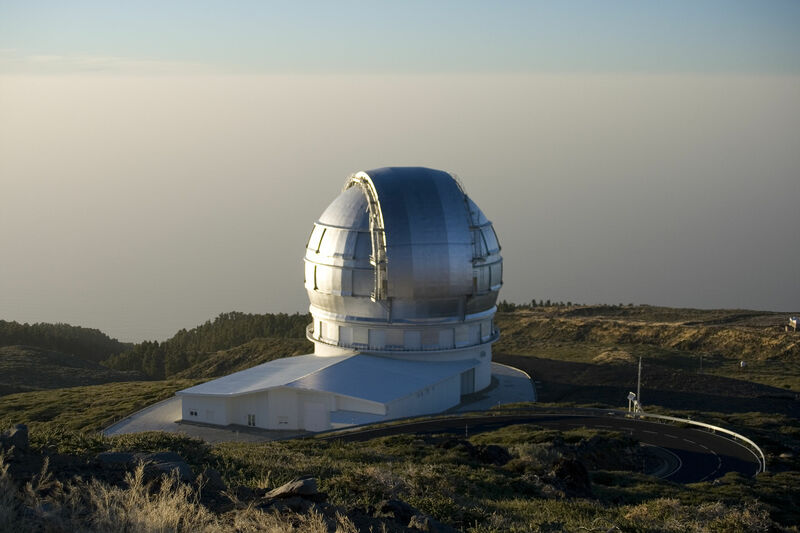 In mid 2013, Javier and his team started a mid-infrared photometric and spectroscopic program using the CANARICAM camera-spectrograph at the 10.4-m GTC telescope at the ”Roque de los Muchachos” Observatory (Canary Islands, Spain). In this talk, he presented the preliminary results of his observational program including the spectra, size, and albedo of 5 asteroids. The Gran Telescopio Canarias formally opened its shutters on July 24, 2009, inaugurated by King Juan Carlos I of Spain. Collaborator Eric Palmer presented his work on “Rough-surface model for surface temperature calculations on Vesta”. He modeled observations by the Dawn Visual and Infrared spectrometer (VIR) to reproduce the observed surface temperature of asteroid Vesta. Interestingly, the observed surface temperatures are significantly hotter than what simple theoretical models predict. To improve the model fidelity, Eric created a ”rough-surface” thermal model that takes into account how irregular grains create variations in the thermal spectrum and described the effect it has on the observed surface temperatures of Vesta. He then applied this method to the VIR observations of Vesta, which produced a high level of agreement with the observed surface temperatures. Co-I Dan Scheeres gave a presentation on “The strength of rubble-pile bodies: Theory, observations, and predictions”. The strength and morphology of a rubble-pile body will control how fast it can rotate before shedding mass or deforming. 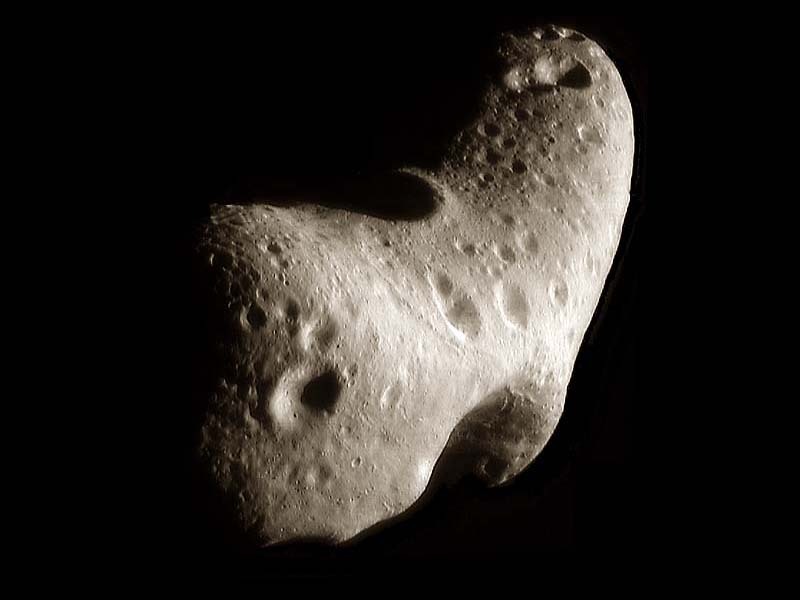 The morphology of these bodies, including the size distribution of boulders and grains, the macro-porosity of these bodies, and the shapes and spin states, are important for understanding and interpreting spacecraft imaging of asteroids, for predicting the evolution of these bodies, and for gaining insight into their formation circumstances. Dan showed that his recently developed theory for the morphology and strength of a rubble-pile body based on the properties of cohesive powders is consistent with several observations of small asteroids. Co-I Rick Binzel described “Meteorite source regions as revealed by the near-Earth object population”. Spectroscopic and taxonomic information is now available for 1000 near-Earth objects. Very clear sources are indicated: Q-, Sq-, and S-type asteroids show clear source signatures through the innermost main-belt regions. V-types are consistent with the orbital dispersion of the Vesta family. Asteroid taxonomy classes interpreted as analogous to meteorites with primitive compositions, B- and C-types like Bennu, show distinct source region preferences for the outer belt and for Jupiter family comets. Postdoc Amy Shaw gave a talk on “Laboratory laser reflectance measurement and applications to asteroid surface analysis”. Laboratory reflectance measurement of asteroid analogs is an important tool for interpreting the reflectance of asteroids. To better constrain the composition and surface texture of Bennu, Amy is conducting experiments to investigate the laser return signature of terrestrial and meteorite analogs to Bennu. The objective is to understand the nature of laser returns given possible compositional, grain size and slope distributions on the surface of Bennu to allow surface characterization, particularly surface grain size, which would significantly aid efforts to identify suitable sites for sampling by OSIRIS-REx. 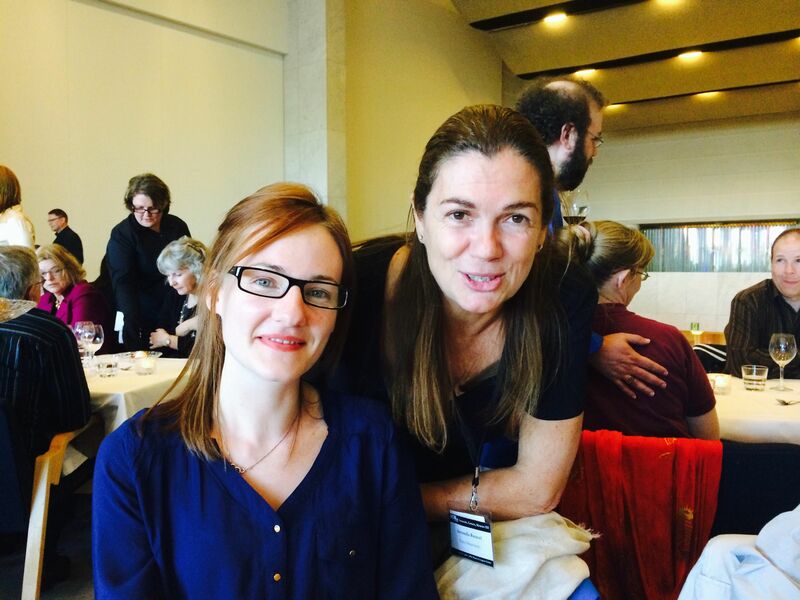 Cateline and Antonella pose for a shot at the ACM conference. Collaborator Derek Richardson presented his latest results on “Applications of granular-dynamics numerical simulations to asteroid surfaces”. Spacecraft images and indirect observations including thermal inertia measurements indicate most small bodies have surface regolith. Since OSIRIS-REx will use a sampling device designed to penetrate the surface regolith and collect up to 60 g of material by propelling it into the device using compressed nitrogen gas, Derek and his team conducted numerical experiments for the expected encounter conditions, including the spacecraft touchdown speed and mechanical properties. Collaborator Ben Rozitiz presented “Modeling of the Yarkovsky and YORP effects”. In his talk, Ben reviewed the latest Yarkovsky and YORP modeling techniques and methods, and discussed the future directions of such modeling efforts. Marco Delbo presented the paper by Collaborator Kevin Walsh on “Seeking diversity in the spectra of the Polana and Eulalia families”. They presented the preliminary results from a spectral survey of two inner Main Belt asteroid families that may be the source of Bennu. The Eulalia and New Polana families are large families that overlap each other very closely in orbital-element space, share similar low albedos and similar visible spectra. They succeeded in observing targets from three distinct groups: those that dynamically could only belong to the New Polana family, those that could only belong to the Eulalia family, and those that dynamically could belong to either. The dominant spectral signature that is found is one more similar to that of Polana. Marco discussed possible reasons for these findings, implications for the history and properties of these two families, and implications for the delivery of km-sized primitive NEOs. Co-I Olivier Barnouin discussed the “The tectonic evolution of (433) Eros”. The tectonic evolution of asteroid Eros can be characterized by several lines of evidence: the observed distribution of tectonic lineaments that cover the asteroid; the low porosity of Eros; observations that some tectonic structures have been re-activated; and the localized effects of seismic shaking near the Shoemaker crater (the youngest large crater on the surface of Eros). These observations were reviewed and interpreted in light of new impact calculations indicating that Eros must have been nearly intact, possessed strength, and had little to no porosity before the largest crater, Himeros, formed. Despite the end of mission in 2001, data from the Near Earth Asteroid Rendezvous (NEAR) mission are still being analyzed. Co-I Antonella Barucci gave an update on the status of the proposed ESA Marco Polo-R asteroid sample return mission. Unfortunately, this mission was not selected for implementation and Antonella lead a great discussion on the future of ESA small-body missions and options moving forward. Collaborator Jay McMahon described his work on “Libration-eccentricity evolution of expansive binary asteroids in the presence of tidal dissipation”. In this work, Jay attempts to quantify under what conditions a binary asteroid can evolve to become an asteroid pair. This requires a detailed investigation of the stability of the secondary asteroid’s motion as YORP adds energy to the orbit while tides simultaneously remove energy. In particular he investigated how various levels of tidal strengths change the stability of the asteroid motion. I gave a plenary presentation on “Integrated science and engineering for the OSIRIS-REx asteroid sample return mission”. The OSIRIS-REx mission has the challenge of visiting asteroid Bennu, characterizing it at global and local scales, then selecting the best site on the asteroid surface to acquire a sample for return to the Earth. Minimizing the risk of exploring an unknown world requires a tight integration of science and engineering to inform flight system and mission design. I focused on three areas of particular importance: Defining the Asteroid Environment, Maintaining a Pristine Sample, and Selecting a Sample Site. One of the great strengths of OSIRIS-REx is how science and engineering teams work collaboratively to achieve mission success. 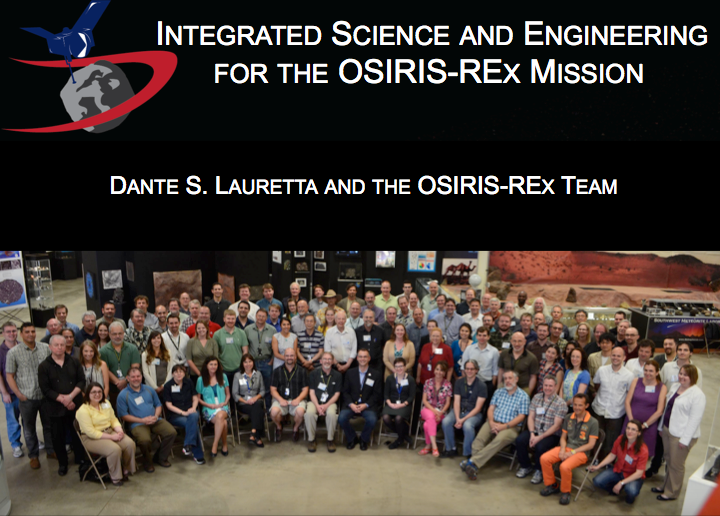 I presented “Integrated Science and Engineering for the OSIRIS-REx Mission” on the last day of the conference. It was a great honor to represent the entire OSIRIS-REx team at ACM this year. Co-I Harold Connolly gave a great overview of OSIRIS-REx mission sample science and Co-I Mike Daly wrapped up the OSIRIS-REx representation with a status report on the development of the OSIRIS-REx laser altimeter. Overall, the mission was well represented and we presented a wide range of scientific and engineering results that demonstrated the breadth and depth of our team.